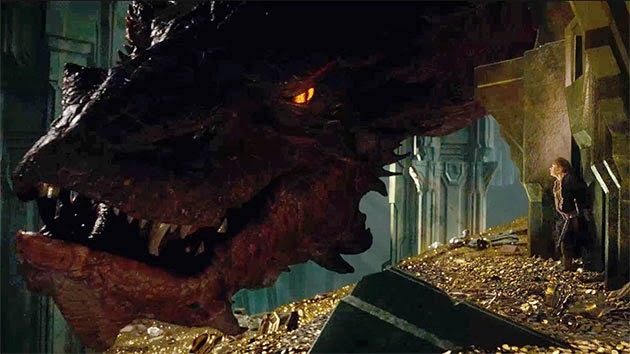 December meant Middle Earth returning to theaters, and The Desolation of Smaug showed the promise of being entertaining. Excited as I was for it, I didn't rush to the theater on opening day. There were scheduling issues and holiday to-dos like wrapping presents, and next thing I realized, it was a week later. Not a big deal but considering I saw the first installment of The Hobbit at midnight on opening day, I knew I was dragging my feet. It wasn't that I didn't want to see the film, but given the length and that I was worried about how padded it might be, it was a commitment to set aside the time. But, I'm happy I saw it. While The Desolation of Smaug didn't blow me away, it was enough. It was very definitely a middle, not handled as well as The Empire Strikes Back or Catching Fire, but still packed with action and interesting characters and forward movement in the story. In fact, it may have had too much of all of those things. The movie jumped around to the different arcs abruptly leaving my head feeling as jarred as if I'd just ridden a rough roller coaster. Fans of the book knew to expect certain story milestones in The Desolation of Smaug: dwarves in barrels, Beorn, Mirkwood elves, Laketown, and the glorious dragon Smaug. Listing the mini-adventures within the bigger one like that makes me stop for a moment and consider maybe splitting The Hobbit apart isn't the worst sin. Given how choppy this movie felt, what would it be like if all of those elements were squished into the first movie? An Unexpected Journey did leave plenty of room for editing, but I can see the argument for two films. As happens when you watch a movie based on a book, I kept a mental checklist in my head of where we needed to go and what we needed to see. Watching the dwarves roll down the river in barrels was absolutely fun and is destined to be a ride at a theme park in the future. Beorn was not at all what I expected but not in a bad way. My only sadness there is that we spent so little time in his house. He sort of gets lost in the battling story arcs. The portrayal of Thranduil pushed perfect. I do have a weakness for Lee Pace (see Thranduil the PieMaker), and he carried the elf-king role with grace and nailed the formality and ego and rudeness. I was equally impressed with Evangeline Lilly as Tauriel. She wasn't on my checklist since she was invented for the film adaptation, but I knew she was present. The path of Thorin continues to be my favorite, but I believe Tauriel was one of the most interesting people to watch in the film. Could I be gravitating to her because she is a female in the sea of men in Middle Earth? Maybe. Okay, probably a little. However, she is far more than “insert lady character” here. Yes, she is physically strong and capable, but it didn't feel forced. As a balance to that, she is compassionate in a stark contrast to Thranduil's coldness. Though I could do without her being an object of love for both Kili and Legolas, I'd rather her character be well-rounded instead of only being a capable warrior. In this light, she gets to show multiple kinds of strength. Tauriel wasn't the only character not present in the book - Jackson added those as well as new scenes. Such changes are a given. The alterations should still fit with the tone of the story. * I liked the additions of Legolas and Tauriel, the tweaks to the Bard's place in the story, gold-covered Smaug, and I didn't mind Kili's injury. The movie could have done without Gandalf's visit to Dol Goldur. Sure, it shows the seeds of Sauron's return and it was referenced (barely) in the book The Hobbit, but it felt like an unnecessary diversion. Then again, what would I have rather done with the minutes from that plot? They certainly don't need to be added back in – I think they could have been cut altogether and saved for the Extended Edition. And even though Benedict Cumberbatch was delightful as Smaug the Magnificent, man, that whole bit in the mountain seemed to take forever. At the end of the day, I can complain or applaud all I want, but the fact is that even if Peter Jackson split The Hobbit movie into five segments, I'd pay to see all of them. And so would many other fans. Sure, a few might drop out if the first one or two aren't amazing. Maybe. But for the most part, I know I'm so excited to see world like Middle Earth portrayed on a giant screen and brought to life that I'm willing forgive a lot of mistakes. And I'm not the only one. * If you want to read a list of comparisons between the book and movies, I recommend this one.